Alfalfa is one of the most nutritionally versatile herbs yet discovered. It is a leguminous herb which grows up to 50 cm. in height. It has rich, green alternate leaves and purplish flowers. The herb adapts itself to widely varying conditions of soil and climate. Alfalfa is a valuable source of vitamin A, B, D, E and G. It also has some vitamin C and blood clotting vitamin K of special value in alfalfa is the rich quality, quantity and proper balance pf calcium, magnesium, phosphorus, chlorine, sodium, potassium and silicon. These elements are all very much needed for the proper functioning of the various organs in the body. Investigations made by the U.S Department of Agriculture in the recent years have revealed that alfalfa contains one and a half times more protein than grains like wheat and corn and that its carbohydrate content is only half of that found in grains. The alfalfa proteins contain such essential amino acids as arginine, lysine, theronine and tryptophane. These ammo acids are of paramount importance in maintaining good health and preventing deficiencies. Alfalfa is one of the richest chlorophyl foods. It is one of the richest sources of dietary fibre, containing up to 20 percent by weight. These abundant nutrients have induced nutritional authorities to experiment with alfalfa as a ready form of easily digestible food for under-developed countries and as a protein concentrate for supplementing modern protein-deficient foods. 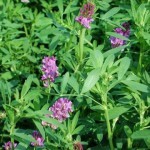 The seeds, leaves and stems of the alfalfa plant provide valuable properties for human beings and grazing animals alike. These properties are derived from the plant’s ability to penetrate as much as 12 meters into the subsoil so that its roots bring the nourishment of the elusive trace minerals from the depths into the plant’s own chemical system. Alfalfa is an outstanding alkalizing food. According to Dr. Breese Jones of the U.S. Department of Agriculture, it contains 130 to 142 units of alkali-forming elements in 100 grams. This makes the herb a valuable remedy for several ailments. It is slightly laxative, digestive, diuretic and an excellent tonic. It builds up both animals and humans into a healthy and vigorous old age. It also builds up resistance to infection. As a fine diuretic, alfalfa acts gently upon the kidneys. It can be successfully employed in the treatment of inflammation of the bladder and dropsy, a disease marked by accumulation of fluid in the body. Alfalfa, in the form of juice extracted from the fresh leaves, has been found very helpful in most troubles with the arteries and heart diseases. This juice is, however, too strong and potent to be taken by itself. It is best taken with carrot juice. In this combination, the individual benefits of each juice are intensified. Alfalfa leaf-juice, as a rich source of chlorophyl, is useful in respiratory disorders and discomforts, particularly those relating to the sinuses and the lungs. The seeds of alfalfa, known as ‘King of sprouts’, are of immense value in the maintenance of health. Their daily use can help build up an immunity to stomach distress. Alfalfa, in the form of tea, provides vital alkalizing benefits for hyperacid stomachs. It tends to control the flow of hydrochloric acid and aids the action of gastric enzyme, pepsin. The addition of mint to alfalfa tea helps to settle disturbed stomachs after an over rich meal. It also refreshes the palate and is therefore, an excellent not drink first thing in the morning. Arthritis patients benefit greatly by the alkalizing of food residues aided by alfalfa tea especially that is made from seeds. Six or seven cups of this tea should be taken by arthritics for at least two weeks. The juice of alfalfa in combination with the juices of carrot and lettuce, taken daily, will help the growth of hair to a remarkable extent. The combination of these juices is rich in elements which are particularly useful for the roots of the hair. The herb is an effective remedy for high blood pressure. It contains all the elements necessary for the softening of the hardened arteries. Alfalfa is used in many different forms. The seeds are useful in the form of sprouts. They are delicious and nourishing in salad and soups as well as on sandwitches. Alfalfa can be used in the form of juice extracted from the leaves.